It's through relationships we create the supportive, inclusive, positive, and caring place we want to see. A place where people can thrive. A place to be great. A place to reach higher and do more. Students are trying to answer these questions. And adults are trying to answer these questions too. The title of this post might be focused on the kids. But all of the adults in the building have these needs as well. These questions are essential to us all. As we work to improve the culture of learning in our schools, we should always keep these questions in mind. Can students and staff members answer these questions positively and confidently? What are we doing to build stronger connections and take care of each other? This week every chance you get, look for ways to help others find the answers to these questions. You can show another person they matter to you. You can lift them up and make them feel like they are valued for who they are. You can show them they are heard. You can notice the unique talents and gifts they have to offer the world. You can show them how they are making a difference. 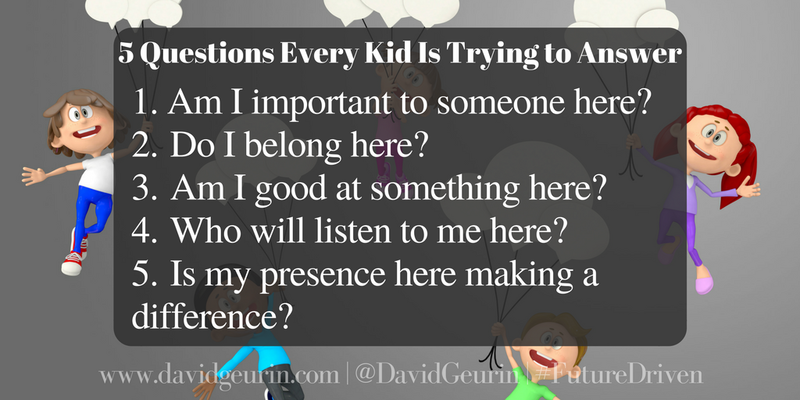 What are ways you are helping your students and your colleagues answer these questions? Who will you lift up this week? Leave a comment below or respond on Facebook or Twitter. It's always a privilege to connect with you. I love kids and answering-questioning with them. They are so sweet and have lovely questions. I am Typical Student in New York collage and studying on kids behavior. So, I am very thankful to you for sharing such a beautiful article.